"The village is large, well built and clean, a few seventeenth century houses still remaining. In the back lane, south of the main street, are two of a century earlier The occupier of one, having taken charge of a goat during the absence of its owner, was aroused by his housekeeper during the night, with the startling information that some person was trying to break in from the roof. It seems that William had travelled to Bradford in his journeyman days, for he married in 1867 at the Parish Church, the daughter of a Durham joiner, Mary Ann Bell, who was living in Bradford. The Rayner's first child, Thomas Henry, was born at Cavalry Barracks, Bradford Moor, in 1869, although William was probably only a civilian farrier attached to the army. Their second child, Ernest Howarth, was born at East View, Idle, in 1871, and baptised at Bradford Parish Church, but died in infancy. By 1873 William had returned to Woodhead to take charge of the forge, which his father, Thomas, had started in about 1850. William's third child, Ernest John, was born at Woodhead in 1875. It seems reasonable to suppose, therefore, that this forge came into the actual possession of the Rayners between 1810 and 1820, when the above William Rayner (born 1781 Yeadon) was then the forgemaster. There is a possibility that he may have been descended from the Rev. James Rayner, who was curate of Guiseley from 1744 to 1754, but the difference in social status makes this unlikely. (It was this clergyman who raised a mob of parishioners against the Wesleyans in 1747.3) William had ten children, and two of his sons, James (baptised Burley Parish Church 1814), and Thomas (baptised Burley Parish Church 1817), appear to have succeeded to Burley in Wharfedale forge somewhere between 1840 and 1845. Thomas was certainly living in Back Lane, Burley, in 1844 when his son William was born. 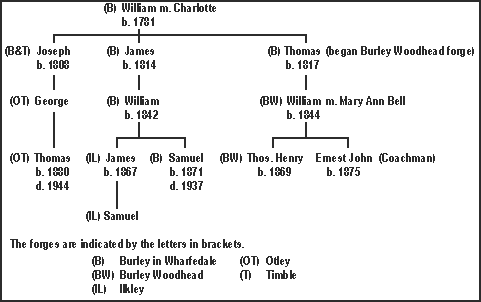 After Thomas left to start Woodhead forge, in about 1850, Burley forge continued under James and his descendants. A plan of the forge shows a single storey building about thirty feet long, set on the corner of a sharp bend in the road opposite the Malt Shovel Inn and St Mary's Church. The forecourt contained a circle of large stones upon which the wooden cart wheels were placed before the heated iron hoops were hammered on to them, and quenched with water drawn, no doubt, from the adjoining beck. The forge was in operation until just before the Second World War, when modern engineering methods began to supersede the traditional blacksmith's craft. Burley forge eventually passed to James's son, William (born 1842), and then to his grandson, Samuel (born 1871, died 1937). Samuel's son, 'Charlie', acted as striker for his father in the latter day's of the forge, and was reputed to be quite a 'character', but he did not continue the business after Samuel died. This forge came into the hands of James Rayner (son of William, born Burley 1842) in the closing years of the 19th century. James was born in Burley but spent his journeyman days in Addingham and Colne. Ilkley forge was then in Leeds Road, opposite the present Crescent Hotel. James, according to his granddaughter, Jose Wood of Birstwith, is said to have shown considerable courage, when a cloudburst over the town caused serious flooding in 1900. He is thought to have rescued one or more persons who were in danger of drowning. James's son, Samuel, continued at Ilkley forge after serving as an army farrier sergeant in the First World War. He retired and in 1960-61 sold the business, which some years earlier had moved from Leeds Road to premises in Little Lane. The forge still exists, although it now makes decorative ironwork, and is no longer in the Rayner family. After fifteen years' research the chance of finding more Rayner-blacksmiths seemed remote, but when all the Burley entries in the registers had been checked, three baptisms did not fit into any part of the family tree They were James (1815), son of Joseph Rayner, blacksmith, and his wife, Mary; and twins named Joseph and Mary (1817) of the same parentage, also baptised at Burley. Knowing that it was often a custom for parents to have their first child baptised in the place where the father was born, I looked further afield and found that Joseph Rayner, blacksmith, married Mary Birch at Bradford Parish Church in 1813 (witness John Brewer, wheelwright, of High Street), and that their first three children were baptised at Burley. Seven further children were baptised at Bradford Parish Church up to 1831, and of these the earlier ones are described as children of Joseph Rayner, blacksmith, 'of Bolton'. At this time, of course, the route to Bolton from Bradford lay up Church Bank (High Street), along North Wing and through Undercliffe, the present Bolton Road not then having been built. Bolton forge was among the cluster of old houses behind the Swing Gate public house in Myers Lane, formerly called Owl Lane, but renamed after Joseph Myers, a Bolton wheelwright and Leeds carrier, who lived there in the late 18th century. The baptismal reference to Joseph Rayner's later children described him as 'of Bradford', at a time when Bolton was not part of the borough. The surmise is that by 1830 he had left Bolton to further his prospects nearer the busy centre of Bradford. The burial of Joseph Rayner, blacksmith, is recorded in Undercliffe Cemetery registers in June 1855, aged 66, which gives a date of birth in 1789. Because his younger children were baptised at Burley it is most likely that he was the brother of William (1781) of Burley forge Of Joseph's ten children, two merit special attention: Joseph (1817), and Thomas (1825). A burial in 1871 lists Joseph Rayner of Northbrook Street, aged 53, which suggests that he was the son of Joseph, the blacksmith, of Bolton and Bradford. Thomas is buried in the same plot as his father, Joseph, and he is described as 'blacksmith, age 38' in 1863, which also agrees with his known date of birth. 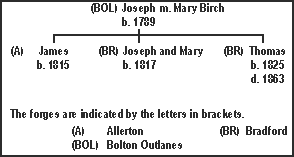 The Census of 1861 also shows 'Thomas and Joseph Rayner, general machine and tool makers, Masons Mill, Mill Street, Bradford', which almost certainly relates to Joseph's two sons, especially as their addresses were very near to the mill, as was the address of their father, who was buried from 10 Middle Street, off Manor Row. The conclusion is that Joseph, who had been drawn from Burley to Bradford, married at the Parish Church, and worked a forge at Bolton Outlanes. He was later attracted to the centre of industrial Bradford, along with two of his sons Joseph had progressed from being the local blacksmith to owning a factory which made machines and tools, a considerable rise in the business world. Joseph Rayner, son of William (1781) of Burley forge, became a blacksmith at Timble Great, but by the Census of 1861 he was back in Burley. His son, George, then sixteen, eventually appeared at Cross Green forge, Otley (White's Directory 1861), and is listed in the Directory in 1881. His grandson, Thomas (1880), continued at Otley forge and died in 1944. Although there is no evident connection with the Rayners of Burley, the Census of 1851 includes William, born Adel 1814-15, as forgemaster. He is also listed in Kelly's Directory of 1881 and White's of 1894. The forge, which is now demolished, stood at the junction of Harrogate Road and Parkin Lane, by the Leeds-Liverpool Canal. Descendants of this Rayner family were Thomas, draper, of Apperley Bridge and Sydney, late Postmaster at Apperley Bridge. Again there is no connection with the main Rayner tree, but we have William, blacksmith, in White's Directory of 1894. Kelly's Directory of 1889 lists James Rayner, blacksmith, of 308 Allerton Road. He is probably the son born 1815 to Joseph, of Bolton James would have been 74 in 1889. My research into the history of the Rayners of Bolton continues in an endeavour to bring them up to date, although they will not perhaps rival the Burley branch, which now has 140 members. Rayners, many of whom were blacksmiths, abound in other places. There were family groups at Tong (mainly gentry), Crofton, Rothwell, Horbury, Ramsgill, Middlemoor, Brighouse, Leeds and, of course, Birstall, where, in the period between 1600 and 1800, at least 64 separate Rayner families were recorded.